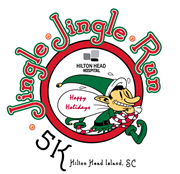 The 27th Annual Hilton Head Hospital Jingle Jingle 5K Run and Health Walk will be held Monday, December 24th at 9am. The first 500 participants receive a long sleeve event t-shirt, jingle bells, and a candy cane. An award ceremony, featuring a visit from Santa, kids fun run, refreshments, hot coco, cider, music, and door prizes will be held following the race.